This article is an attempt to describe, outline, and present to the reader the monasteries, churches, and pilgrimage sites located in the Armenian and the Hay-horom (Armenian speakers who belonged the Greek Orthodox denomination) towns and villages of the Kaza of Agn, itself located in the Province of Kharpert (Harput). The information presented in this article was preserved and provided to us mainly by folklorists, geographers, and clerics who were natives of Agn, as well as foreign travelers who visited the area. For the sake of convenience, we have categorized the information according to locale. The research outlined in this article focused specifically on the history of the religious sites located in the City of Agn, Abouchekh, Charaz, Gamaragab, Garoushla, Areki, Narver, Lidj (Lidjk), Penga (Pingian), Araga, as well as Hay-horom villages of the Agn area (Vank, Tsorga, Mousheghga, and Shrzou). The City of Agn was located at a latitude of 39°29’ east and a longitude of 39°15’ north, at an altitude of 1,018 meters above sea level . In the north, the city began near the Sandek Baghlar neighborhood, and stretched alongside the Euphrates River all the way to the villages of Areki and Gamaragab. The boulder of Gamaragab was considered to be the boundary of the city . The City of Agn had three churches – The Holy Virgin, Saint Kevork, and Saint Hovnan Vosgeperan [golden-tongued]; and six pilgrimage sites – The Waters of Immortality, Saint Hagop, Saint Talalos, Saint Krikor Lusavoritch [Gregory the Illuminator], Luys Aghbyur [Spring of Light], and the Nerses Shnorhali [Nerses the Gracious] Monastery. The Holy Virgin Church was located in the city’s upper neighborhood. It was built of bricks and lime mortar, and featured columns. According to A. Kechian, the church had a length of 27 meters, a width of 20.5 meters, and a height of 10.5 meters. The church was completely renovated in 1840, at the expense of 5,000-6,000 Ottoman pounds. The architect of the church was Father Yeranos, an Armenian priest from Papert. Later, an artist was commissioned to paint images and floral patterns on the church’s walls and ceiling . The Saint Kevork Church was also located in the upper neighborhood of Agn. Construction of the modern building that housed the church began in 1874, and ended in 1876. The church was constructed in the traditional Armenian style, with a domed roof. It had a length of 24 meters, a width of 10 meters at its center, and a height of 10 meters. The diameter of the dome was 12 meters. A total of 6,000 Ottoman pounds were spent to build the church. The architect was Hovhannes Donigian, from the village of Sagham in Palu . The locals were involved in the construction of both these churches. They carried sand, stones, and other constructional material to the sites. The labor performed by the locals during the construction of each church was calculated at a value of 2,000-3,000 Ottoman pounds . According to Vidjagakrutyun, the Holy Virgin Church had seven serving clergy, and Saint Kevork had six. In later years, H. Janigian wrote the former had three serving clergy, and the latter had two . The dome of the Saint Kevork Church was timbered . According to the Untartsag Oratsuyts [Comprehensive Calendar] of the Saint Savior Hospital of Istanbul, released in 1925, as of 1924, the only Armenian church still standing in Agn was Saint Kevork . The Saint Hovnan Vosgeperan Church is mentioned in two 16th century sources. The first of these sources was included is the work Toros Aghpar [Brother Toros] by K.V. Srvantsdyants , and dated from 1516. Information regarding the second source was communicated to us by H. Mgrdich Bodourian, from the Frumoasa City in Romania . Both of these primary sources were written by an author named Mesrob . According to Gh. Injijian, the Saint Hovnan Vosgeperan Church was reduced to ashes in a fire in the year 1655 . The Waters of Immortality was a site located to the left of the point of confluence of Medz Tsor and the Euphrates. 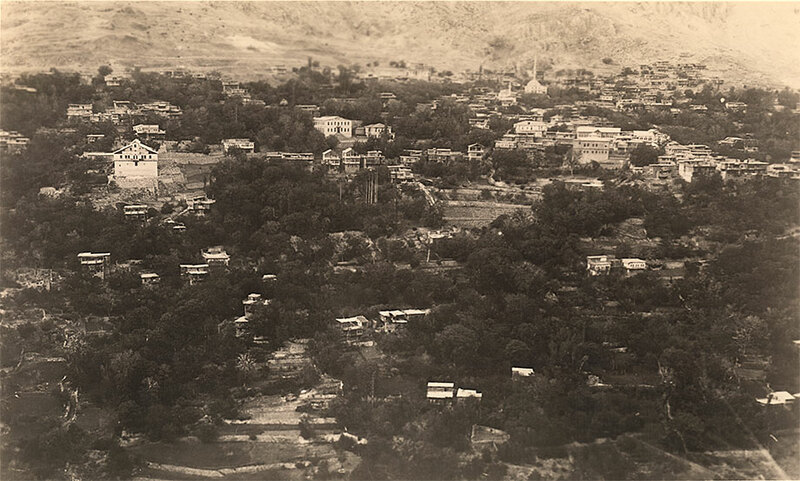 According to Archbishop Kevork Arslanian, the site was located in the city’s heights . The Saint Hagop Holy Site was located between the City of Agn and the villages of Abucheckh and Gamaragab, near a graveyard . Janigian notes that the name Saint Hagop was given to a large boulder located at the foot of Mount Tashdib . Archbishop Kevork Arslanian, expounding on Janigian’s information, adds that a church named Saint Hagop had once stood near Agn or Kadi Geol (kadi meaning a religious magistrate, and geol meaning lake). At some point, the church was converted into a mosque. However, the church’s old cabinet, containing the clerical vestments and ceremonial vessels, was kept inside this mosque. According to legend, this cabinet remained shut, and nobody was able to open in. In fact, the hands of those who tried to pry it open became withered. To this day, locals do not approach the cabinet, claiming it is cursed. As the mosque’s main gate looked eastwards, the adhan (call to prayer) was performed out of the gate opening onto the road. As for Christian pilgrims, instead of the original site of the Saint Hagop Church, they made their pilgrimages and said their prayers at a large, solid boulder located near the Zinjirli Rock. A popular custom at the pilgrimage site was placing a small rock on top of a larger one. If the smaller rock did not fall off the larger rock, the pilgrims considered their vows to have been accepted by God . Saint Talalos [according to Janigian and A. Kechian], Saint Talalis [according to Vidjagakrutyun], or Saint Tallas [according to Archbishop Kevork Arslanian] was located in the upper neighborhood, in the middle of the graveyard or in a toutloukh (mulberry orchard). According to Vidjagakrutyun , the eponymous saint had the power to heal the wounds of those who visited the site . By 1847, the pilgrimage site was listed as being a “church in ruins” . 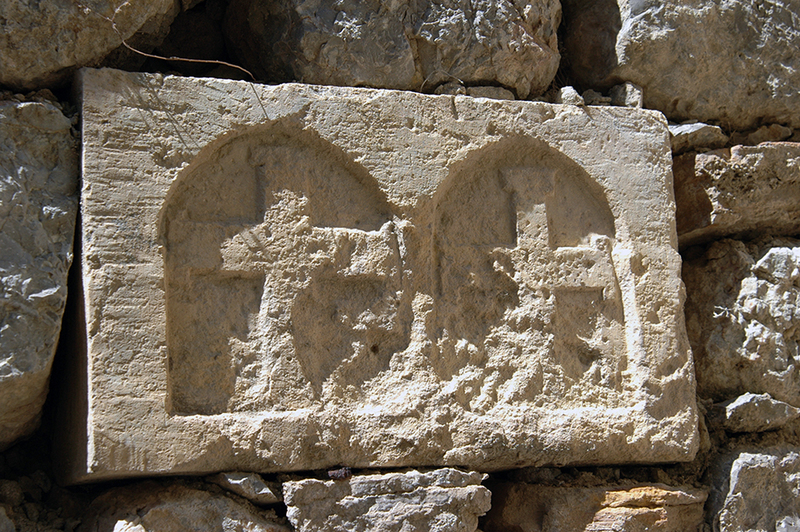 The Saint Krikor Lusavoritch Site was located in the heights of the Areki neighborhood. It consisted of the ruins of a church, built of bricks, and which featured one altar. Services were held at the site on the Feast Day of Saint Krikor Lusavoritch . Luys Agbhyur [Spring of Light] was located across from the City of Agn, in the Tsndzalents gardens . The Nerses Shnorhali Monastery was located at a distance of six to seven hours from the City of Agn, near the Alawite Kurdish village of Gamkhou. The monastery, which did not function as a place of worship, was located in a water-rich field. Only the skeleton of the church building was still standing . Aside from those detailing the traditions associated with the monastery, no other accounts of it have survived . Villagers regularly visited the monastery, where they prostrated themselves before God. These pilgrims came from Agn, as well as from other nearby villages . A plant named manana grew in the fields surrounding the monastery, which the locals neither planted nor harvested. The plant produced seeds that tasted like milk and had a yellow, delicate shell . 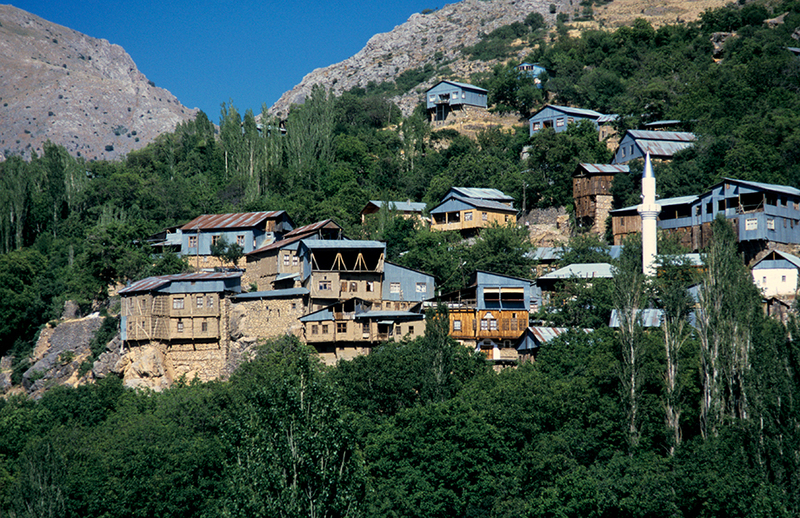 Abouchekh was one of the largest villages in the Kaza of Agn, located to the southeast of the City of Agn . 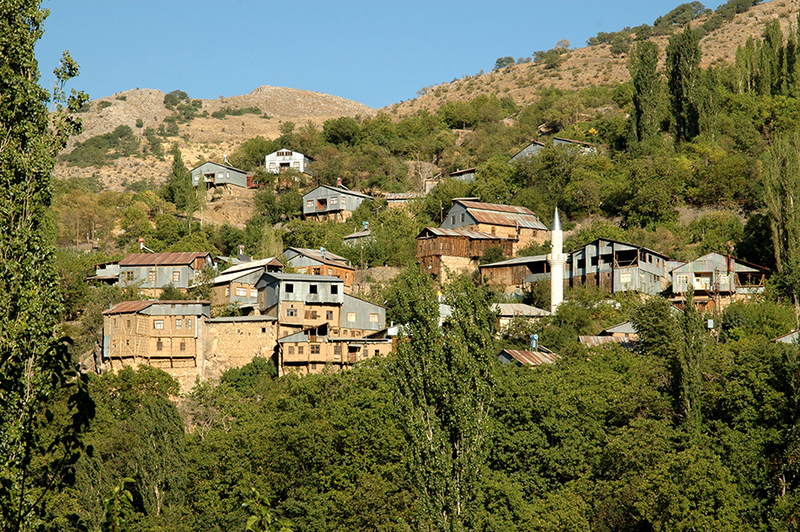 The locals called the village Ebichekhou, but in formal documents, the name Abouchekh was always used, and it became the prevailing appellation of the village in the 18th century . The village of Abouchekh had one church, called the Varaka Saint Nshan Church. The church was in existence as early as the 14th century. The church appears in written chronicles beginning in 1651. The following text appears in a Haysmavourk (a hagiographic publication, which lists the details and biographies of saints celebrated in religious ceremonies) from the year 1702: I kyughs Abouchekh, ent hovanyav sourp Asdvadzazin yev pazmacharchar nagadagin sourp Kevorka [In the village of Abouchekh, under the ministry of the Holy Virgin Church and the Saint Kevork Church, the latter named after the saint who underwent much suffering]. However, the Holy Virgin and Saint Kevork churches were located not in the Village of Abouchekh, but in the City of Agn . The Saint Nshan Church was renovated twice – in 1691, with funding provided by Markar Chobanian; and again in 1706, with funds raised from the public . The church was home to many handwritten manuscripts , valuable clerical vestments, and silverware, as well as many delicate oil paintings. Among the vestments that had been preserved with care was a very valuable chasuble donated by the Der Boghosents family, and which was later rescued from the calamities of 1915 . According to legend, this chasuble had been sewn by seven maidens over a period of seven years. The presiding priest of the church would don this chasuble for Christmas and Easter services. However, in the year 1912, by decision of the village council, the last priest of the village, Father Ardashes Papazian, gathered the valuable vestments, curtains, silverware, manuscripts, and Bibles, and were transported to Istanbul, where the valuable items were placed under the care of the Armenian Patriarchate . By 1899, the church had lost its former luster and glory. The village priest, Father Hovhannes Nalpantian, burned several paintings, deeming them to have been ruined by the ravages of time . In 1847, figures indicate that four priests served at the church . The church was also the repository of a historical chronicle, with entries beginning in the year 1100 of the Armenian calendar (1651 CE). 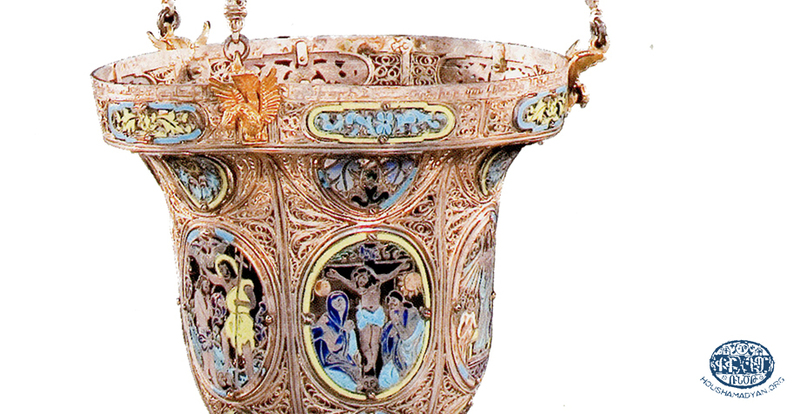 The chronicle details the items that had been donated to the church (vestments, crosses, etc. ), as well as the names of the donors. The chronicle was kept until the deportations of 1915. However, as noted in one source, it would have been difficult of the village priest to update the chronicle after the year 1899 . Gh. Injijian writes that in the 19th century, there were two shrines in ruins located in the Village of Abouchekh – Saint Minas and Saint Sahag . A human hand was dug up in the courtyard of Saint Sahag, and the locals believed that this was the hand of Saint Sahag himself . The Holy Virgin shrine, also called Akarag. The churches of Saint Toros, Saint Sahag, and Saint Hagop, all in ruins, and located outside the boundaries of the village. There was yet another church named for Saint Toros in the village, which also served as a pilgrimage site . H. Janigian, whose information was obtained in the 1880s, only mentions the Saint Hagop, Saint Minas, Saint Sahag, and Saint Toros shrines . A. Kechian mentions two open-air, single-altar churches. The first was Saint Hagop, which was located in the village graveyard, atop a high hill, and the second was Saint Minas, located in the orchards adjacent to the city . Akrgner, which is the Akarag mentioned in the Vidjagakrutyun of 1847, home to a pilgrimage site in honor of the Holy Virgin. On September 8 of every year (the holiday of the Nativity of Mary), Mass was held at the site. It is supposed that there was once a village near the site – H. Injijian mentions Akarag as one of the Armenian villages of Agn, with a mixed Armenian-Muslim population . This village is also mentioned in the review Yevroba, published in Vienna by the Mkhtarine Order . According to A. Kechian, the village was Islamized and then renamed Arch-Akrag . Saint Hagop: on the holiday of Saint Hagop, the people would visit the site in a large procession, mainly in the evening . Saint Toros: Similar festivities were held at this site . Saint Minas: The people of Abouchekh believed that Saint Minas helped people find what they had lost. Every year, up to 1898, on the Monday following the Feast of Vartavar (Feast of Transfiguration), Holy Mass was held at this site, and participants slaughtered animals in honor of the saint . There was another small pilgrimage site adjacent to Saint Minas, called the Sister of Saint Minas. The site was renowned for curing those who suffered from ailments of the eyes. People washed their eyes with the water of the altar, and tied rags around the branches of the nearby bushes, believing this would cure them . Saint Sahag: Saint Sahag was the healer of the disabled. The locals visited the shrine in the hopes of being cured of their disabilities . Saint Toros: Holy Mass was held once a year at this pilgrimage site . In one of his articles, A. Shepigian writes that among the old churches of the Gamaragab and Abouchekh were several shrines bearing the name of Saint Toros, located in graveyards . The Saint Toros Church of Abouchekh was also mentioned by Archbishop Kevork Arslanian . This village, which was called Cheraz in the 19th century, was, according to H. Injijian , adjacent to the Village of Abouchekh, and according to H. Janigian , was located at a distance of about ten minutes from Abouchekh. A. Kechian mentions that at the time of his writing, the villages of Cheraz and Marendounig no longer existed . Some of the residents of these villages had emigrated, while others had resettled in Abouchekh. According to Vidjagakrutyun of 1847, Charaz was a neighborhood of Abouchekh, and it was home to the ruins of a church named Marendounig  (the name is a bastardization of the term Mayr Dirouhi (another name for the Holy Virgin), as dourig was a common bastardization of dirouhi). According to A. Shepigian, Marendounig played an important role during the first deportations from Charaz, serving as an infirmary for those who needed surgical intervention. Holy Mass was held at the church once a year, and the pilgrims would tie rags to the branches of the nearby trees, thus leaving their cares behind in this holy place . Gamaragab was located to the southeast of the City of Agn, at the feet of a hill near the banks of the Euphrates. The village was completely nestled amidst fruit orchards . Gamaragab had two churches – the Holy Virgin and Saint Kevork. Gh. Injijian mentions that this “beauteous” church was gutted by a fire, and then rebuilt during the reigns of Sultan Osman III (1754-1757) and Grand Vizier Raghib Pasha (1756-1763) . The reconstruction of the church began in 1757. According to H. Janigian, it had been rebuilt by 1835. A. Kechian  provides the year 1766 as the date of the church’s reconstruction. The Holy Virgin was located in the center of the village. It was built with stone and sand mortar, and was of medium size . Prior to the fire that burned it down, the church had a wooden roof, like all contemporary constructions . On the right-hand side of the church, in an underground cave, was the shrine of Saint Santoukhd the Virgin, alongside her relics. A painting this saint, much revered by the women of Gamaragab, hung on the wall of the church . A. H. Shepigian postulates that this painting was damaged during the massacres of 1895 . The Saint Santoukhd Shrine was particularly popular with pilgrims who sought healing for ailments of the eyes . Father Karekin Artsruni was one of the priests who served at the Holy Virgin Church. He was also a researcher and a linguist, and had been ordained as the priest of the church in 1875. He served in this capacity until he was killed during the massacres of 1895. For many years, he also taught in the village school, and served as the chairman of the local rural religious council. He owned library, and was a subscriber of many national and literary journals . The Holy Virgin Church was in possession of many heavy church vestments, silver torches, maps, and golden vessels . The Saint Kevork Church, which was mentioned in 1847 alongside the Holy Virgin Church , was located in the southern section of the village. The walls of the church were built using sand mortar, and its roof was domed. According to a manuscript found by A. Kechian, and written by Father Hovhannes Tertsagian, the church was renovated in 1767, thanks to funding provided by Movsesyants Khoja Tavit . In ancient times, the Saint Kevork Church was called Anabad [Desert]. According to legend, the church was built atop the grave of the hermit Kevork . Throughout the year, special services were held at the altar of the church. The church was always open to worshippers on Saturdays . The son of an old widow has been working abroad for long years, and the poor widow did not even know where he was. She appealed to Saint Kevork – “Oh Saint Kevork, bring me back my son!” Her son, it turned out, was working as a manservant in the home of a rich man in faraway lands. One day, Saint Kevork, astride his horse, appeared before the son, while the latter was pouring tea for his master. The saint lifted the son onto his horse, and the two appeared before the widow, the young man still holding the teapot in his hand . According to Vidjagakrutyun of 1847, three priests served in the two churches of Gamaragab. However, the text does not specify whether each church had three serving priests, or whether the three priests took turns ministering in the two churches . Gamaragab was home to nine pilgrimage sites – Deort Lule, Holy Cross, Ismir Khatoun, Pashayents Asdvadzamayr, Saint Nigoghos, Boghos-Bedros, the Der Ampagoum Grave, Saint Hagop, and Saint Nerses Shnorhali. While singing the last line, the young women would cut the flowing water with their scissors. In the late 18th century, Senior Priest Father Krikor proscribed this pagan ritual, which was never mentioned again in records . Holy Cross: The site was located in a corner of the valley located on the left bank of the Euphrates. The site featured a consecrated cross-shaped stone. The site was destroyed in floods in 1880 . Pilgrimages to this site were thought to cure eye pain and smallpox. The site was also visited by mothers who wished to wean their babies off their milk. On every Good Friday, lines of pilgrims would visit the site and beseech the Holy Virgin and the infant Jesus to bless them and their children with forbearance . This pilgrimage site was once occupied by the Saint Khachadour Church, which received a gift of a Bible in 1670 . Ismir Khatoun was located in an orchard on the road to Gamaragab, underneath a jutting boulder. Ismir Khatoun had been a local healer, treating youth who developed solid lumps on the left side of their abdomens (these lumps were thought to have been caused drinking icy water while perspiring, and was commonly known as dalakh gabel).The orchard had belonged to a woman who guided the sick to the pilgrimage site, lay them down near the rock, then collected grass from the orchard, and placed this grass, alongside some salt, where the sick had lain. The abdominal lump would then shrivel and disappear . According to A. Kechian, this pilgrimage site was called Ismir or Ismir Khatoun, and was also the gravesite of Gasho’s Mother . The story of Gasho’s Mother, or the Widow, is one of the folk tales of Agn. According to legend, she was married to the priest of the Village of Gasho, and she campaigned against apostasy. One day, she came to the village of Gamaragab, stood on the edge of the Euphrates, and called to all the Christians to keep her memory, and to burn incense in her memory every Saturday. In exchange, she promised to “untangle the tangled threads of silk” for the people. Then, she leapt into the river and drowned . Pashayents Asdvadzamayr: This site is associated with a legend. 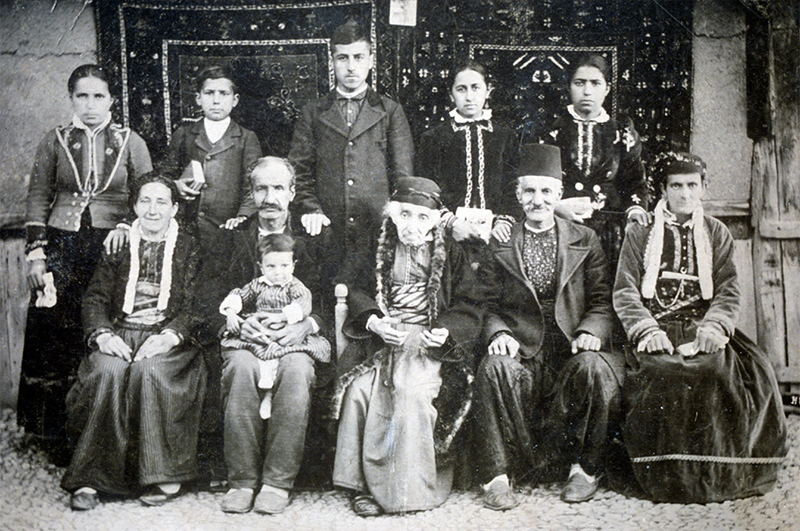 A clan by the name of Pashayan lived in Gamaragab. The matriarch of this clan, a woman named Koran, had been married for a long time, but had never borne a child. She spent her days and nights entreating God to grant her a child. One night, in her dreams, she heard a voice telling her to go to the banks of the Euphrates, where she would find an image of the Holy Virgin that she would bring home. Thereafter, she would be blessed with a child. The following evening, the woman went to the river’s edge, and there she a saw floating piece of wood, which bore the image of the Holy Virgin. She took the image home, and thereupon, she bore many children. Since that time, infertile women have been visiting the site to implore the Holy Virgin to grant them fertility . The Saint Nighoghos or Khoshrougi Church was located southeast of Gamaragab, beside a boulder in the orchards . Sometimes, children between the ages of three to six months developed a skin disorder, and blisters appeared on their heads, faces, and other parts of their bodies. This condition was known as khoshroug. The locals believed that it was dangerous to treat this condition with medication, because the medication would harm the heart, and the child could die. So, grandmothers would take the children to Saint Nigoghos to seek treatment. There was a pool of water near the church, in which the grandmothers would bathe the children. They would light candles, burn incense, and leave eggs or coins on a rock nearby. They would then tie rags to the branches of the bushes near the rock, in a gesture that was meant to leave the disease behind. Another custom involved fixing gobidjes (polishing stones for clay plates) to the rock, in order to give further validation to their pilgrimage vows. If the skin condition disappeared and the child’s family was satisfied, the vows were supposed to have been accepted by the saint . Boghos-Bedros [Paul-Peter] was located south of Gamaragab, near the spring called Hovid or Ovid. People would visit the site to seek miraculous treatment for lumps that would appear on their skin. After making their vows, the pilgrims would tie rags to the branches of nearby bushes, and also throw a few rags into the spring. Their lumps would then disappear . The Grave of Father Ampagoum was known as a destination for pilgrims suffering from all medical conditions. According to legend, Father Ampagoum had served as a priest in Gamaragab, and had died sometime in the 19th century. One night, Father Ampagoum visited the church to prepare for the following morning’s service. As he opened the door, a wolf appeared and approached him. In the ensuing struggle, the priest killed the wolf and removed its liver. But he was so terrified by the experience that he barely made it back home. Forty days later, Father Ampagoum died, vowing in death to cure all uncurable illnesses . Pilgrims would first collect water from seven different springs, and take the water to the grave. There, they would pour the water into a circular aperture on the surface of the grave. Three days later, the patient would visit the grave, bathe in that water, light handles, and leave her shirt on the grave. This was thought to cure the patient . The Saint Hagop Church was located in a graveyard and had an altar . The Saint Nerses Shnorhali or Vza Church was located on the opposite side of Mount Vza, on rocky terrain . Garoushla was located beneath the heights adjacent to Gamaragab, on the slope that led to the banks of the Euphrates. Garoushla was at a distance of half an hour from the City of Agn . The village was home to a single house of worship – the Charpakhan Saint Cosmas and Saint Damian Unmercenaries, also called the Choukhdag Monastery, and three pilgrimage sites – the Holy Virgin, Saint Makos the King, and Saint Nerses Shnorhali. The church of Garoushla was located to the south of the City of Agn, on the left side of the villages of Garoushla and Gamaragab, near the Morsnger Valley. The villagers had dubbed the saints Cosmas and Damian Saint Choukhdag (holy twins), and the monastery was consequently called the Choukhdag Monastery. The people of the village also used the names Garoushla Monastery and Vow of Areki . The building of the monastery was shaped as a square, and was built of polished, dense stones. It was built in the Byzantine style of architecture. The name of the monastery indicates that it had once served the Hay-horom community . The date of the monastery’s construction is not known. According to A. Kechian, the graveyard across the monastery contains gravestones dating as far back as 1172, 1176, and 1194. According to Kechian, these were the graves of clergymen, which had been ravaged by centuries of exposure and rain . The monastery’s church was a two-storied structure. The main church had two altars (or, according to K. Srvantsdyants, three small altars) , an ancient crucifix, and ancient paintings. There were another two altars on the church’s second story. The windows were not wide, so the interior was always steeped in mystical darkness. According to K. Srvantsdyants, there were also three partial altars on the roof, where services were held, while according to Janigian, there were two unsheltered altars on the roof . Adjacent to the church were cloisters, detached structures, a small kitchen, and a guest room for the pilgrims. The immediate area of the church, which included the graveyards of the Garoushla and Areki villages, was dotted with trees and khachkars, as well as ancient graves and gravestones . Most of the orchards adjacent to the monastery belonged to residents of Garoushla. Most of the monastery’s land was owned by Muslim settlers or local Armenians. Consequently, the monastery seemed much more like a pilgrimage site than a church . Through the four seasons of the year, large numbers of Muslims and Hay-horoms came on pilgrimages to the site, to make their vows to the twin saints . There were days throughout the year set aside for visiting the monastery and spending time there, specifically Easter Monday and Low Sunday . On Easter Monday, hundreds of villagers, particularly those who had returned from working abroad and those who were unemployed, alongside many others from nearby villages and he city, would gather round the monastery, filling up the fields, the orchards, and the roofs of houses. Some would play cards, others would race horses, and yet others play music, dance, and simply enjoy the day. For them, Eastern Lent had ended, and now they looked forward to the next Paregentan. The festivities lasted into the evening, when the people would return home . According to H. Janigian, people would also gather at the monastery on Low Sunday, but the crowds would be relatively small, compared to those that gathered on Easter Monday . Aside from the aforementioned occasions, on every Sunday, the elderly and the youth, grandmothers and brides came to the site to make their pilgrimage vows, and afterwards to sing, dance, and participate in contests and games . Out of all the villages of Agn, Areki and Garoushla were the only ones that saw to the procurement of the monastery with necessary supplies. Regular church services, however, were held on Saturdays and Sundays only in Garoushla. These services were attended by priests from the surrounding villages, suburbs, and the city. Holidays and feast days of saints were celebrated with much greater pomp and slaughtering of animals led by the abbot. On those days, the number of pilgrims climbed into the thousands. The beggars and the destitute benefited greatly from the plentiful meat from the offerings, and returned home with bundles of food . A substantial number of pilgrims visiting the monastery were Armenians, Greeks, or Alawite Kurds (Kezelpashes) suffering from fever. Some of them would travel for two or three days to reach the monastery and seek divine treatment. As for those who couldn’t make it to the site, they would send gifts and bundles of thread with acquaintances and friends. The bundles of thread would be placed on a table during Mass, and the priest would read the Nareg, the Psalms, and the Bible over them, and after making a few knots in the thread, would hand the bundles back to their owners . Charpakhan Holy Virgin was located at the bottom of the main road into the village. The area was rocky, and thistles grew near the monastery, to which pilgrims would tie their rags, in order to rid themselves of their ailments. Pilgrims would visit this site when they sensed that a natural disaster was imminent. Some of pilgrims also believed that travelers on the road were stoned by nymphs. As a defense, the people had erected a consecrated cross in the ground . Saint Makos the King or Mokouts Bed was located in the side of a boulder, across the valley on the road from Gamaragab to Garoushla . A. Janigian  mentions this pilgrimage site as Mokos the King, while A. Kechian  calls it Saint Mokos the King and A. Shepigian calls it Mokouts Bed. According to H. Janigian , mokos means big . 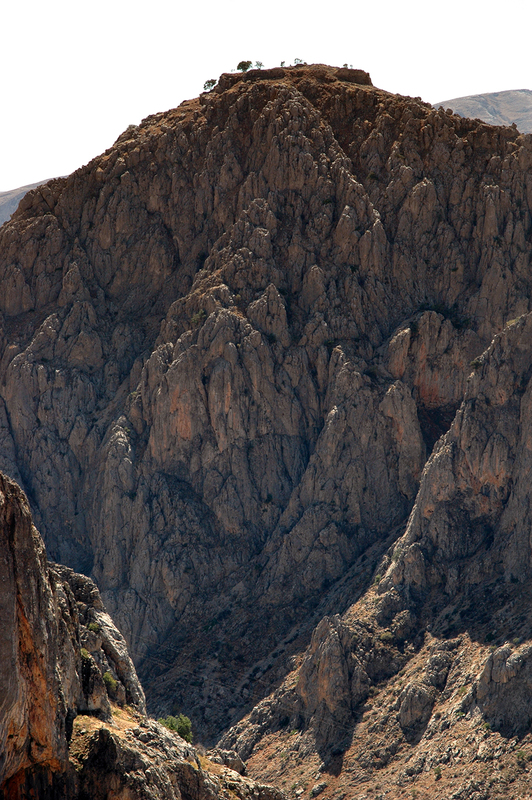 According to Archbishop Kevork Arslanian , Mokos the King was the name given to a boulder located halfway between the villages of Garoushla and Gamaragab. According to legend, mischievous nymphs stoned travelers who strayed near the site. The priests had decided to consecrate a cross and erect it in the ground, and from that day on, the stoning had ceased . A. Shepigian recorded the following story that the residents of Garoushla told about Mokuts Bed. Around 1890, the neighbor of one of the large houses in Gamaragab noticed a light appearing in one of the windows of the house, followed by the sound of a galloping horse. The neighbors then told the woman that they had been visited by Saint Mokuts Bed, and the woman consequently furnished that room, burned incense, and lit a candle . Another day, a man traveling to the village from Gamaragab heard the sound of a galloping horse behind him, and turned around. He saw Mokuts Bed – a man with a thick beard, riding his steed with a chalma (headgear worn by local Muslims) on his head, wrapped in a khrkha (coat), and who galloped up a boulder and then disappeared from view . Saint Nerses Shnorhali was located at a distance of an hour or an hour and a half from the Village of Garoushla. This pilgrimage site had once been the serving church of the village. The church was surrounded by a wall that barely rose a meter above the ground. It was visited mainly by the deaf seeking a miraculous cure. They would often cross long distances to reach the site, traveling silently and in bare feet . They would tie a rock to their waists and walk around in circles around the church three times. They would then return home, taking with them a small rock from the site. They would keep the rock for a few days, pressing it against their ears, and then would return it to the site and give to back to Nerses Shnorhali . The Village of Areki, which was considered a district of the City of Agn, was nestled in orchards. It was divided from the city itself by the plots of land called Hoghtar and Djermag Taroug . Areki was home to one pilgrimage site, namely Saint Krikor Lusavoritch, located on a hill in the village. The site was unsheltered and unroofed, but had a small, enclosed altar, where services were held on the Feast of Saint Gregory . The Village of Narver was located north of the City of Agn, near the Sherz Bridge. The bridge linked two boulders, each on one side of the river – the Rock of Sherzu or Vank on the left bank, and the Rock of Narver on the right bank. The Village of Narver was located past the Rock of Narver on the right bank . Narver was home to one church, the Saint Minas Church, and twelve pilgrimage sites – the Holy Virgin, Khachaghbyur, Khntragadar, Saint Nicholas, Saint Thaddeus, Navdour, Saint Sarkis, Araga Monastery, Saint Khatounig, Saint Shamam, Part, and Averdouk. The Saint Minas Church was a sturdy structure, built of polished stones. The church was decorated with various images and icons, including one that depicted Saint Minas astride his white steed, plunging his spear into the throat of a dragon, while his steed’s silver horseshoes trample the dragon’s head. According to records, in 1847, the church had two serving priests . The Holy Virgin site was home to the ruins of a church, which served as a pilgrimage site for the villagers. The site was located 10-15 minutes from the village. According to legend, the Holy Virgin had once served as the village church. Records show that in 1840, a copy of a Haysmavourk]  was gifted to the Holy Virgin church by the people of Navrer (as the village was formerly known). There were several churches named Holy Virgin in the area of Agn, but if the people of the village had gifted the manuscript to another Holy Virgin in another village or city, the name of that locality would certainly have been recorded . The locals believed that the church had been built by the Apostle Thaddeus, and had named it Holy Virgin on the River . The church was nestled in a garden that grew around the tomb of one of the village’s former priests. The site was also home to another tomb known as Saint Hagop . There were two other pilgrimage sites in the area around the village, known as Khachagpyur [Spring of the Cross] and Khntragadar [Granter of Pleas], and two more on the banks of the Euphrates, known as Saint Nicholas and Saint Thaddeus . At a distance of five to ten minutes from the last two sites, on the banks of the river, was a cave of khachkars known as Navdour. Across from it was a solid boulder known as the Boulder of Narver, and which often inspired terror in travelers and caused shipwrecks on the river . At a distance of an hour from Narver, at the summit of the mountain, was the pilgrimage site that bore the name Saint Nicholas, also known as Ziyaret Tebes (Mountain of Pilgrimage) to the local Muslims. The site was visited by Turks and Kurds, as well as Armenians. The Muslims pilgrims observed the custom of tearing a piece of their clothing and tying it to a nearby tree. Sometimes they also tied thread to the branches. The Armenians abstained from this practice . Between Narver and the Turkish village of Abrank were the ruins of the Saint Sarkis Church. The locals would point out the marks that the sparking shoes of Saint Sarkis’s steed had made on the nearby rocks, and they would kiss these marks . At a distance of two hours from Narver was the Araga Monastery. A tree resembling a juniper grew along the road from Narver to the monastery, and was considered sacred by the locals, who tied rags to its branches . Five minutes’ distance from the monastery were the ruins of a church at the site known as Senegner. The locals believed the church had been built on the orders of the Arstruni king Senekerim . The orchards of Narver were also home to the pilgrimage sites of Saint Khatounig and Saint Shamam (according to A. Kechian, the latter name is a bastardization of the name Shamiram ), as well as to a spring, known as Paradise to local Armenians and Turks alike . In the heights of the village, on the flanks of the mountain, were stone-built structures at a site known to locals as Pert [Fort]. At the feet of the mountain were foundations of old homes that had been destroyed, called Averdouk [Ruins]. Spears, arrows, and other weapons had been excavated from this location . The Village of Lidj or Lidjk, also called Lishg by the locals, was located northeast of the City of Agn, on the left banks of the Euphrates. It was at a distance of five , seven , or eight  hours from the city . Lidj was home to the stone-built Holy Virgin Church, constructed in the 16th century. According to Vidjagakrutyun , in 1847 the church had two serving priests, and in 1896 only one . The Village of Penga, also known as Pinga or Pingian, was located on the left bank of the Euphrates, at an altitude of 1,069 meters above sea level. The village was surrounded by impregnable mountains and impassable gorges . According to Vidjagakrutyun of 1847, the village of Penga had one church, the Holy Archangel Church, and two serving priests . According to H.D., the church was founded by the Jijian Amiras, and was home to several handwritten manuscripts . According to Vidjagakrutyun of 1847, the church was located “facing the village, on the left bank of the Euphrates, right before the bridge”. The chapel was once in ruins, but a few years prior to the publication of Vidjagakrutyun, it had been renovated by order of the Sultan. According to H.D., the chapel was rebuilt thanks to the efforts of Peryan Agha and the sons of the Amira Nersesian . According to Vidjagakrutyun of 1847, another small, ancient chapel stood right on the bank of the Euphrates, called Saint Yerits Mangants (Three Holy Infants), located at a distance of half an hour from the village . In a letter written by Father Hagop Jan, priest of Penga, the village had three churches – Holy Archangel and Holy Virgin in the center of the village, and Saint Yerits Mangants on the other side of the Euphrates. Holy Archangel was at a distance of ten minutes, and Holy Virgin twenty minutes. Aside from these churches, the village was also home to three pilgrimage sites, and one more was located outside the village boundaries. At a distance of half an hour from the village, on the banks of the Euphrates, there were some ruins where a church had once stood . A. Kechian, however, wrote that the village had only one church, and the Holy Virgin, Saint Yerits Mangants, and Saint Hagop were only pilgrimage sites . A handwritten manuscript from 1781 mentions a “Saint Zion Church of Penga”, which is not mentioned in any other records . V. Yorke reported coming across an Armenian church on road from Agn to Penga, about two hours outside of Penga. He described it as a simple church that “was certainly of some age” . Saint Hagop was located amidst irrigated fields and orchards. The pilgrimage site was housed in a small hut, whose door was always left unlocked. Inside stood several khachkars . The hut was built by a pious woman around or slightly prior to 1893, in order to make the site more noticeable to travelers on the road. Those who came across the hut customarily went on their knees and prayed or crossed themselves . K. Srvantsdyants mentions the ruins of the Holy King, Holy Cross, Saint Nicholas, and Saint Khanagdour churches in the environs of the village. According to A. Kechian, these were pilgrimage sites . Aside from these, Penga was also home to two more pilgrimage sites – Vari Monastery and Yerevman[Apparition] Monastery. The Vari Monastery or Saint Yerits Mangants Monastery was located on the banks of the Euphrates, at a distance of three-quarters of an hour from Penga . The monastery building was in ruins, and its artifacts had been stolen. Underneath the dirt and dust of the surrounding area, however, one could still see the outline of the church building and the bricks and mortar that made up the church’s arches. These ruins were a testimony to the monastery’s erstwhile prosperity and wealth. The fields and pastures surrounding the monastery had long been in the hands of the locals. By the years after 1895, only three orchards and a few fields had been left, alongside a spring with a beautiful pond. There was also a shrine on the bank of the Euphrates, built by Amira Mardiros Ghonchegulian . The arches that were found in the fields and that had been excavated indicate that the monastery had been built in as far back as the Roman era, and had later been converted into a Christian monastery and place of worship . In the past, the monastery had served as a center of the Apostolic faith, and had been home to its own order. Among the most prominent clergymen who served at the Monastery were Father Krikor Taranaghtsi, Levend Keshis, Father Stepan, etc . A few of the order’s handwritten manuscripts are preserved in the repository of the Holy See of Echmiadzin. One of the most valuable among them is a Bible inscribed in small letters on parchment, and illuminated with several stunning illustrations, floral flourishes, and golden ink. The Bible was restored in the 19th century in Istanbul, and entrusted to the Holy Archangel Church of Penga. The Bible, whose value was estimated at 200-300 Ottoman pounds, was burned in 1895 during the massacres . Archbishop Kevork Arslanian writes that the aforementioned copy of the Bible made mention of the famous Saint Hagop church, located on the opposite side of the Euphrates . There was also another manuscript – a Haysmavourk, with floral-decorated margins and Armenian bird-lettering. The manuscript ended with a series of meghas [chants recanting sins] . On the Day of Remembrance, following Easter, services were hold at the Vari Monastery, and meals were hosted in honor of the dead. Services were also held on the occasion of the Feast of the Ascension. The site also hosted gathering in celebration of National Constitution Day . On these holidays, pilgrims came to the Vari monastery from as far as Gasma, Narver, Zimara, Lidj, and Hasa Ova . There were small shrines scattered around the monastery (Saint Hagop, Saint Sarkis, Saint Hovhannes, Saint Nicholas, Holy Cross, Dede or Holy King, Saint Hovhannes of the Lower Spring, Saint Hovhannes Yeghigants, and Khntragadar), as well as khachkars . The Yerevman Monastery of Penga (also Saint Yerevoum, Holy Savior, Agn Monastery, and Penga Monastery. Called Penga Monasterer by the Kurds, and sometimes Monastery of Lidj) was located on the left bank of the Euphrates, at a distance of six hours from the City of Agn, three hours of Penga, and an hour and a half from LIdj . According to legend, the monastery was built by a general named Blatigos or Abladigos, Yevdakeos or Yevsdateos, around the years 100-120. Vark Srpots maintains that the Roman general Ablodigos, who lived only forty-five minutes away from the monastery’s site, once went on a hunting expedition, and found himself chasing deer. The deer ran up a nearby hill, and hid behind a clump of trees. The general had nocked the arrow and was preparing to launch it when he saw a cross shining among the deer. He threw down his bow and arrows, and built a square-shaped shrine on the side of the hill. According to legend, those trees behind which the deer hid are in full bloom to this day . Access to the monastery could only be gained after scaling hundreds of stone steps . Years after the construction of the original shrine, a splendid church had been built at the site, protected by walls. In the 1880s, the abbot of the monastery was Senior Priest Father Hagop Hopigian. According to Archbishop Kevork Arslanian, the monastery owned large, multi-storied buildings, as well as a barn, a tonir bakery, an oven, cattle sheds, a kitchen, a granary, quarters for the servants, cloisters for the monks, and comfortable rooms for pilgrims. Three icy springs flowed in the grounds . Its mountainous position, sturdy walls, and strong metal gates gave the monastery the appearance of an impregnable fortress. Father Krikor Taranaghtsi, who visited the Penga Monastery in 1611, and who lived there for a year while copying the Bible, wrote that the monastery was “a fort for those who battled constant depredations” . He added – “there were many structures in the compound, and all amenities provided” . In the courtyard of the monastery, on the right side, was a long row of willows and poplars, and on both sides of the courtyard stretched pastures, which would take an hour to walk across. Right in front of the monastery was the area called Khas Baghchan (Plentiful Orchard), with its beautiful pond, its vines, and its fruits trees. Large ceremonies were held in the courtyard on the occasions of Myuronatap [the ceremony of using an infant’s baptismal water to bather her or him a week after the baptismal ceremony, after which the infant may be bathed with regular water] . The monastery’s main source of income was the sale of sheep’s milk, grass, calves (of which it owned almost 500), as well as bulls . Another source of income for the monastery was the donations of the vidjagayins (parishioners), fees charged for marriages, gifts from pilgrims, and several properties it owned in Istanbul (including the number 54 room above the Valide Inn, which, in 1884, produced 10-12 Ottoman pounds of income; another room in the Sumbuli Inn; and another in the upper floor the Alaja bathhouse’s inn, which was in ruins). These diverse sources of income were sufficient for the monastery to meet its financial obligations, and during the tenure of Senior Priest Father Hagop Hopigian, the monastery’s accounts were fully balanced . At its heyday, the monastery had its own monastic order, and the abbot was the prelate of the Agn Prelacy. In 1623, Bishop Hovhannes is mentioned as the “Prelate of Pengi” . Former abbots included Bishop Mgrdich Hrashakordz [Miracle Maker] from Dikranagerd, Father Sare, etc . The abbots of the monastery spent their entire summers at the Yerevman Monastery . The pilgrimage days of the monastery included the week of the Apparition of the Cross, Vartavar (Feast of Transfiguration), and in particular, the week of the Ascension of Mary. Pilgrims would travel for up to four days to reach the Yerevman Monastery. 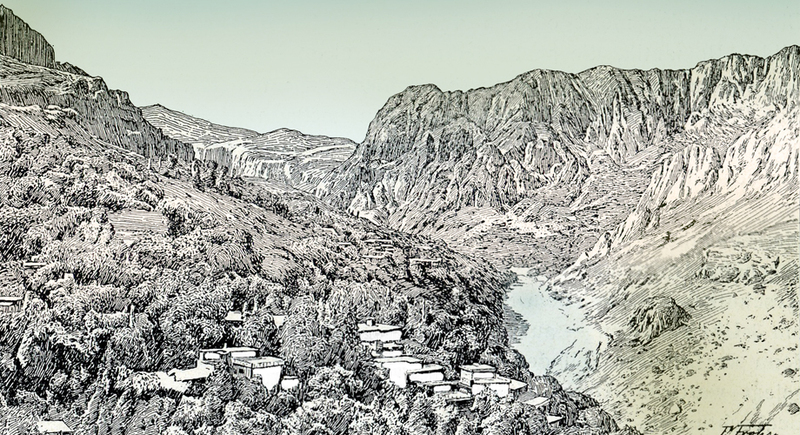 The Muslims of Dersim and the environs revered the monastery even more than the Armenians . Senior Priest Father Hagop Hopigian related to H. Janigian that some of the books that had been kept at the monastery had been transported to the city. Among these had been manuscripts which had not been considered ancient at the time. In 1880 the monastery possessed two handwritten Bibles, one of which was undated, while the other, according to the abbot, had been transcribed 250-300 years earlier. According to Archbishop Kevork Arslanian, the monastery was savagely looted at a later date, and its riches, including the books, vanished. According to H. Janigian, the monastery possessed clerical vestments and valuable vessels . 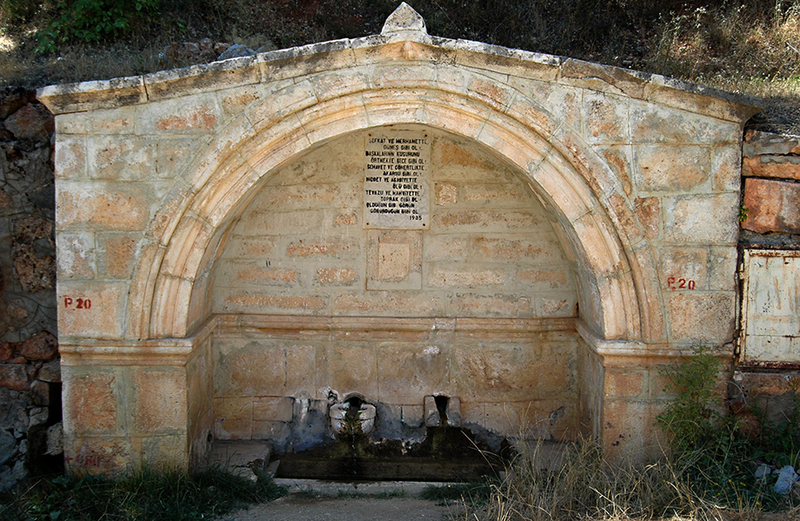 Below the monastery was a warm-water spring, called Cheopler Marin. It was said that any iron tossed into the spring would turn to copper. By the time of Gh. Injijian’s writings, this spring had already disappeared . The Village of Aaraga was located a distance of six hours from Agn, four hours from Penga, and two hours from Narver . The village had once been a section of the City of Agn, but had later been conjoined with Divrig . In the heights of the village, in the fields where the Kurds brought their herds to graze, was a pilgrimage site called Araga, also known as Naregavank. The latter appellation, however, was colloquial and unofficial. According to tradition, in the 11th century, when the monks of the Naregavank Monastery in Van, alongside King Senekerim, settled near the area of Agn, they brought with them the remains of Saint Krikor Narekatsi [Gregory of Narek]. They purportedly built a cloister and a church, and there they buried the saint’s remains. The village was called Narega, which was bastardized over time to Araga. Kechian mentions that this legend seems to have been invented to explain the village’s name, as the term Narega was unlikely to be distorted. The term had survived in its original form in many other areas . H. Nalian wrote in 1758 that the Village of Naregavank (he did not use the name Arega) was named after the Naregavank Monastery . Naregavank was surrounded by walls that were 12 meters long and 10 meters thick. The compound included the chapel, the parvis, and the slaughterhouse . There were conflicting reports regarding the condition of the church. H. Nalian makes no mention of the structure’s condition. Gh. Injijian only writes that “outside the village, on the side of the mountain, was the grave of Saint Gregory Narekatsi, protected by walls. It is said that a church had once stood there, and had been destroyed.” Janigian writes “the altar of the chapel was sheltered under some wooden boards, while the rest of the church had no roof at all,” then adds in a note that in 1887 the church had both proper walls and roofs. Archbishop Kevork Arslanian wrote in 1934 that the chapel was “partially roofed” and that only the four walls of the monastery remained. Begian wrote in the same year that in 1904, Father Kevork Arslanian (later Archbishop) had initiated the renovation of the monastery and the “temple”, that the walls of the “temple” had been adorned with large khachkars, and that Arslanian himself had officiated the consecration ceremony. A. Kechian wrote that according to the Turks of the Araga Village, the renovation of the monastery had been funded by the Misakian family of Agn . Smpad Tavityan, writing in 1901, described Araga as a monastery with low walls and no roof, with a consecrated altar that had been blackened by the smoke of incense and candles . Adjacent to the monastery was an unimpressive structure in which pilgrims sought shelter from the rain and cold. 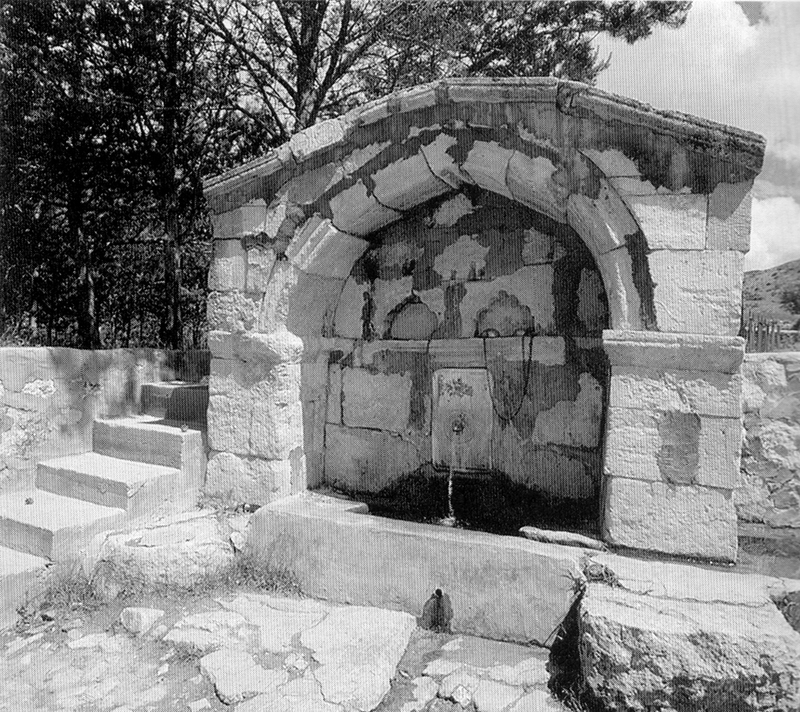 According to one record, there was a spring near the gates of the monastery, with a pond built of polished stones, and which had been financed by the wife of Amira Misak. There was also a large structure to the east of the monastery, which served as a dormitory for visiting pilgrims. To the south of the monastery was the slaughterhouse, and beside it the graveyard. The monastery owned large tracts of land, where pilgrims would slaughter animals as offerings to God . The monastery had no silverware and no cabinets. The door was always open, and a villager had taken it upon himself to protect it and take care of the grounds. According to Gh. Injijian, a Turkish woman cared for the grave of the saint . Archbishop Kevork Arslanian asserts, without providing evidence, that the monastery was founded by the Artsrunis (meaning, King Senekerim or one of his progeny), that it had once been very prosperous, and that its lands included the villages of Araga and Gamkhou, as well as the forests and pastures that stretched to Narver, Mangasar, Dillou, Kayl, and the Euphrates River . Araga was famous as a pilgrimage site, and many pilgrims came from near and far (from Agn, Abouchekh, Gamaragab, Garaoushla, Arki, Penga, Lidjk, Zimara, Dantseni, Girason, Mrvana, Gasma, Odour, Arapgir, Divrig, etc). The majority of pilgrims, however, were natives of Agn . In addition to daily pilgrimages, large processions to Araga were organized on the Feast of Saint Krikor Lusavoritch, the Ascension of Mary, and Vartavar. The number of pilgrims would sometimes reach the thousands. Some of the pilgrims would find shelter in caves, while others would pitch tents near the monastery. The number of tents would sometimes reach 500-600 . The blind, lame, insane, and the epileptic would make pilgrimages to the monastery, in the hopes of being cured. Some would come simply to spend time, as pilgrimage sites served as athletic grounds for the young men, and recreational sites for the girls and women, where they would walk about all day, singing and dancing . Archbishop Kevork Arslanian mentions the name of Bedros Kouyoumdjian from Agn, who was brought to the monastery on the verge of death, suffering from bleeding, and was cured miraculously . By invitation of the pilgrims, and sometimes with no invitation at all, priests would sometimes participate in the pilgrimages, holding services at the site and blessing the offerings . The pilgrimages would end on Sunday . A. Kechian writes that for some time, the offerings brought by the pilgrims were donated to the Armenian school in Narver. A board of trustees had been formed in Agn, reporting to the administrative board (1887) . After the events of 1895 and 1897, the Turks began coveting the monastery, encouraged by the fact that it was located in open field and there were no Armenian villages near it. The Turks would often block access to the eastern altar of the monastery, and instead, they would construct shrines in the southern end for the Turkish and Kurdish pilgrims . During Armenian pilgrimages, the prelates of Arapgir and Agn, Father Moushegh Seropian and Archbishop Kevork Arslanian, in the presence of the pilgrims, would re-consecrate the monastery’s altar, and would dismantle the Muslim shrines, but immediately after the pilgrimages, the Turks would re-erect their shrines . A. Kechian writes that the Turks coveted the graveyard of the monastery, and that lawsuits had been filed to resolve the issue. The Muslims insisted that the land of the graveyard belonged to a pir (Alawite cleric), but eventually, Armenians were able to prove ownership . According to A. Kechian, the Araga Monastery was constructed on the site of an older church, which had shut its doors. The echoes that footsteps made on the floor were evidence of this other church that had sunk into the ground. According to tradition, this other structure had been the original monastery and the grave that contained the remains of Saint Gregory Narekatsi, as well as the treasures that had been donated to the monastery by the Artstrunis. It was said that at some time in its history, the monastery had been broken into and looted of its entire wealth . Archbishop Kevork Arslanian relates that Bedros Kouyoumdjian, who was healed miraculously at the monastery, also saw a dream in which he was ordered to excavate the area behind the altar’s walls. As a result, a one meter-long stone passage was found, and it was ascertained that the church was buried seven meters into the ground . To the north of the monastery was the Grave of the Chobni (or chobani, meaning shepherd), which was considered a pilgrimage site. A zihi (type of tree) grew beside the grave, to which pilgrims had tied rags for many years . To the south, four or five minutes from the monastery, was a spring, which the residents of Araga called Luys Aghbyur (Spring of light) . 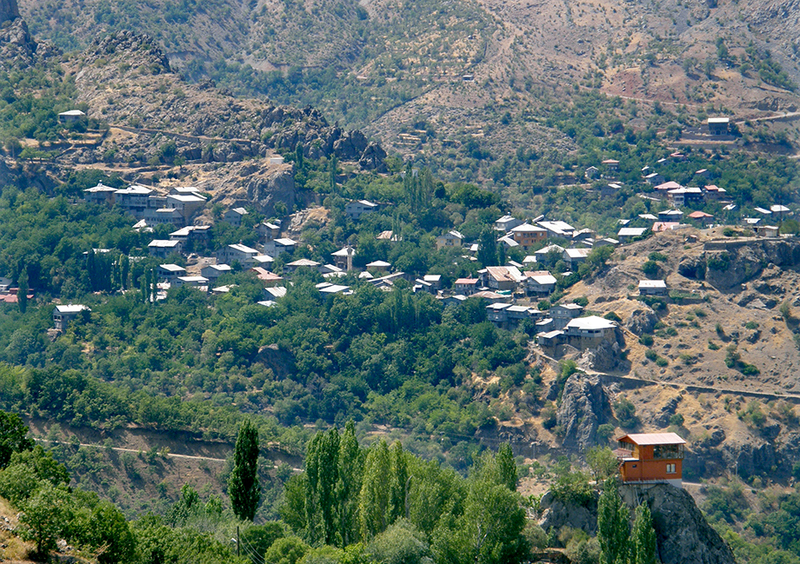 The most prominent of the Hay-horom villages in Agn was Vank. It was located on the left bank of the Euphrates, to the left of the northern gates into the City of Agn, across from the city’s neighborhood of Sandekbaz . Vank was home to one church – Aya Yorgi or Saint Kevork, which was located in the foothills of the village, on a rocky hill that rose on the bank of the Euphrates. According to one record, the church was renovated in the year 1723. H. Janigian considers it likely that the church had once served as a monastery, and that the village had been named after this monastery . The church was surrounded by elegant plane trees . Services at the church featured Greek Orthodox rites, but the Haysmavourk, Mashdots, prayer books, and the Mass book were translated from Greek to Armenian. The translations of the Mashdots and prayer books were printed, while those of the Haysmavourk and Mass book were handwritten. The church also had portions of the old and new testaments printed as Armenian translations, as well as printed Greek bibles. Worshippers who knew Greek used the Greek material, while the others used the Armenians material. The Armenian used in services was so affected by Greek interlocution that a listener would have difficulty distinguishing it from Greek . Aya Yorgi was also a pilgrimage site for the locals. Armenians from all over Agn visited the monastery once a year, to hear services held at the shrine of Saint Sarkis . The monastery and the school affiliated with it were financed by funds generated by property owned in the City of Istanbul . According to Vidjagakrutyun, the village church was home to a shrine named after Saint Sarkis the Warrior, which was considered a pilgrimage site in its own right. It was located at a distance of only half an hour from the City of Agn, and was housed in an ancient structure . 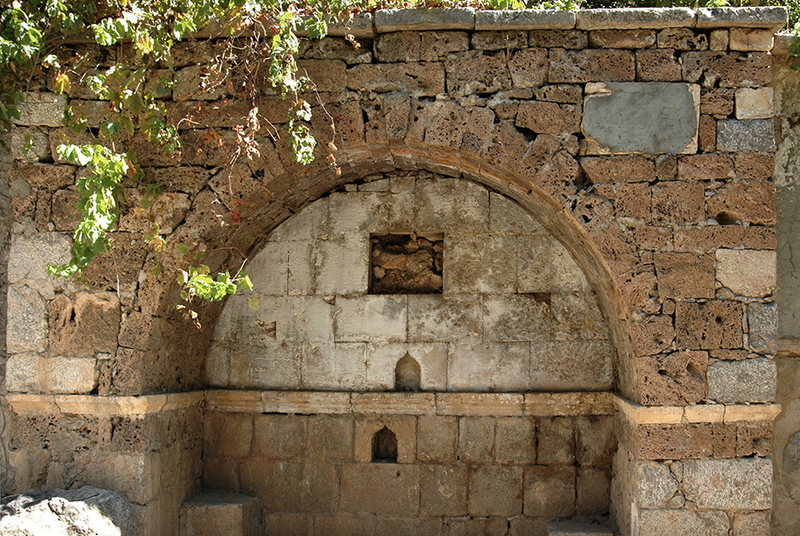 According to A. Kechian, this shrine was called Saints Sarkis and Mardiros (the latter was the former’s son), and was located adjacent to the church. The shrine was looked after by the beadle of the Aya Yorgi Hay-horom church . Tsorag was located opposite the City of Agn, at a distance of an hour and a half  or an hour  from it. The village was not visible from Agn . By the grace of God, the church of Saint Hovhanes [Nicholas] Vosgeperan has once again been renovated, thanks to the efforts of Ansdas Agha, in memory of his late father Amira Mahdes [title given to a Christian who has made the pilgrimage to Jerusalem]Stefan. May this church stand in honor of the Amira and his wife. Amen. Sene [year] 1243 (Islamic calendar). Our Lord’s year of 1831, finished in the month of March . H. Janigian, however, writes that the inscription on the door of the church read “Holy church of Saint Nicholas. Year 1794” (this information was communicated to Janigian by Doctor Yani, son of Lazar, from the Village of Vank) . S. Kechian mentions that in fact, the Saint Hovhanes Vosgeperan Church was located in the Village of Shrzi . The Saint Kevork Armenian shrine was located adjacent to the Ay Nigol Church . There was a lofty mountain near Tsorag, which the locals called Saint Sarkis Mountain. A tower built of polished stones had once stood on the summit of this mountain. Only the foundation and lowest section of the tower were visible. Sometimes, metal spearheads were found in the ground . A. Kechian asserts that there were once many legends associated with this fort, but that they had not been handed down . According to A.Kechian, The Saint Sarkis Mountain was a pilgrimage site, while Gh. Injijian claims that the ruins of the summit were actually the foundation of a monastery . The Village of Mousheghga, which is sometimes records as Mousheghgan, was at a distance of an hour from Tsorag, to the northeast of the City of Agn . Moushegha was home to the Saint Kevork Church, in which Armenians were assigned a shrine-like altar . H. Janigian notes that the shrine was built during the renovations of the Sain Kevork Church (in 1880), after an agreement between the Greek Orthodox and the local Apostolic Armenians, who also wished to avail themselves of the church facilities . According to Gh. Injijian and Vidjagakrutyun, the church was called Saint Hovnan Vosgeperan . Shrzou, also Shrzi , was located to the south of the City of Agn. It was not visible from Agn, despite being connected to the city by a bridge . Shrzou was home to a church named Hovnan Vosgeperan, and one serving priest . A. Kechian writes that in the past, the village had been populated exclusively by Armenians, and had been home to a church called Saint Nicholas. Kechian supports this theory by citing Yeremia Chelebi Keomurdjian’s Orakrutyun , in particular a section headed “i tsoragn Agna”, meaning “the surroundings of Agn”. However, the cited pages do not contain any mentions of the Village of Shrzou, nor the Church of Saint Nicholas . Aside from, the church, the village was also home to a pilgrimage site, located in the heights of village and called Khanegdour. This site was mostly visited by those who sought relief from abdominal pains . The presence of Apostolic Armenian shrines adjacent to the Hay-horom churches in the villags of Vank, Tsorag, and Mousheghga has an interesting history. A. Kechian asked Lazar, from the Hay-horom Village of Vank, to examine old records and farmans (also fermans, decrees issued by the Ottoman Sultan) associated with churches, preserved in a leather-bound tome. According to one of these documents, in the 17th century, when it became necessary to repair these churches, Hay-horoms appealed to the Supreme Porte to request permission to make these repairs. The Supreme Porte, however, replied that Hay-horom churches belonged to the Armenian community, and that the government did not officially recognize the Hay-horoms as a minority group. The intervention of the Greek Patriarchate did not resolve the situation, and the Hay-horoms, in desperation, appealed to the influential Amiras of Agn. 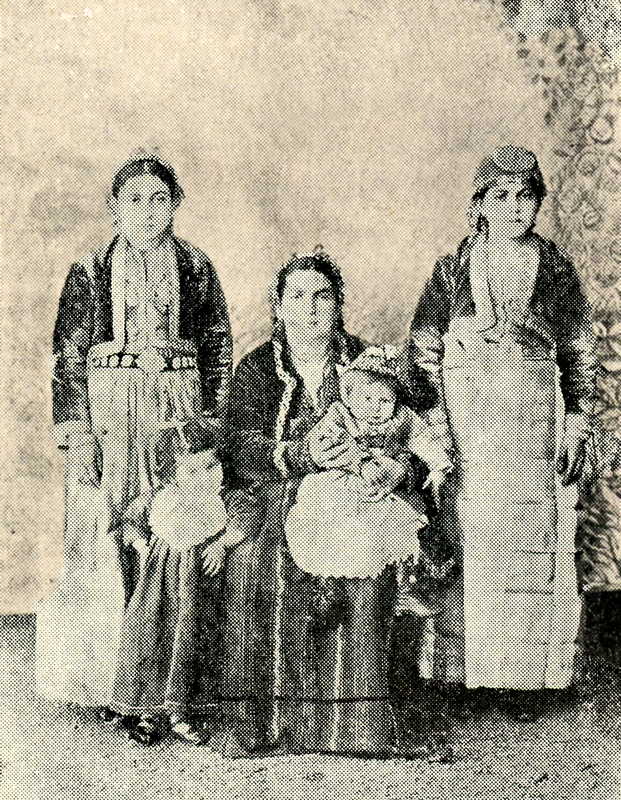 On the advice of Father Minas Agntsi (later Patriarch and Catholicos of All Armenians), and led by Amira Seghpos Yerevantsi, the Hay-horoms petitioned to the government again, and with some difficulty, finally obtained the farmans that allowed them to renovate their churches, but under the condition that they were named after Armenian saints. Instead, the Hay-horoms decided to build shrines adjacent to their churches, to names these shrines for those Armenians saints, and to allow Agntsis to visit these shrines once a year on the feast days of the shrines’ namesakes. Pilgrims were free to visit the shrines on those days . Arakel Kechian and Mgrdich Barsamian, Agn yev Agntsik [Agn and her People], Paris, 1952, page 129. Vidjagakrutyun Agna Kaghakin yev Polor Vidjagatsen [Census of the City of Agn and the City’s Perishioners], prepared on February 11, 1847, published on April 19, 1847, in Armenia. Agn yev Agntsik, page 139. Untartsag Oratsuyts S.P. Azkayin Hivantanotsi [Comprehensive Calendar of the Holy Savior National Hospital], Istanbul, Der-Minasian Printing House, 1900, page 146. Karekin Srvantsdyants, Toros Aghpar [Brother Toros], A, page 230. Ghougas Injijian, Ashkharhakrutyun Chorits Masants Aghkharhi [Geography of the Four Corners of the World], Part A – Asia, Venice, St. Lazarus, 1806, page 306. Agn yev Agntsik, page 142; Father Kevork Arslanian, Pazmaveb, 1936, page 435. Agn yev Agntsik, page 142. Hovsep Janigian, Hnutyunk Agna [Antiquities of Agn], Tbilisi, 1895, page 38. Father Kevork Arslanian, Pazmaveb, 1936, page 435. Agn yev Agntsik, pages 142-143. Agn yev Agntsik, page 143. Arakel Kechian, Agn yev Agntsin, 1020-1915 [Agn and the Agntsi, 1020-1915], Volume I, Bucharest, 1942, page 34. Agn yev Agntsik, supplement, pages 149-156. Agn yev Agntsin, 1020-1915, page 35. Agn yev Agntsik, page 62. Agn yev Agntsik, page 63. Ashkharhakrutyun Chorits Masants Aghkharhi, page 307. Agn yev Agntsik, page 64. Agn yev Agntsin, 1020-1915, page 34. 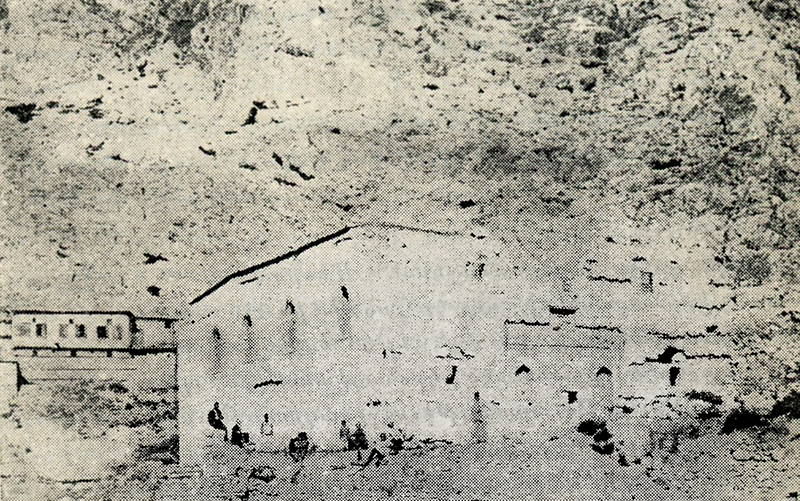 “Agna Oukhdadeghiner” [“Pilgrimage Sites of Agn”], Pyuragn, page 90. Yevroba [Europe], Issue 41, page 163. Agn yev Agntsik, page 65. A. Shepigian, “Havadalik yev Oukhdadeghiner Agna Kyugheroum” [“Religious Beliefs and Pilgrimage Sites in the Villages of Agn”], Pyuragn, 1900, November, N. 44, page 692. Father Kevork Arslanian, Pazmaveb, 1934, page 434. Agn yev Agntsik, page 67. A. Shephigian, Pyuragn, 1900, January, N. 2, page 20. Agn yev Agntsik, page 69. Agn yev Agntisn, 1020-1915, page 29. Agn yev Agntsik, page 75. 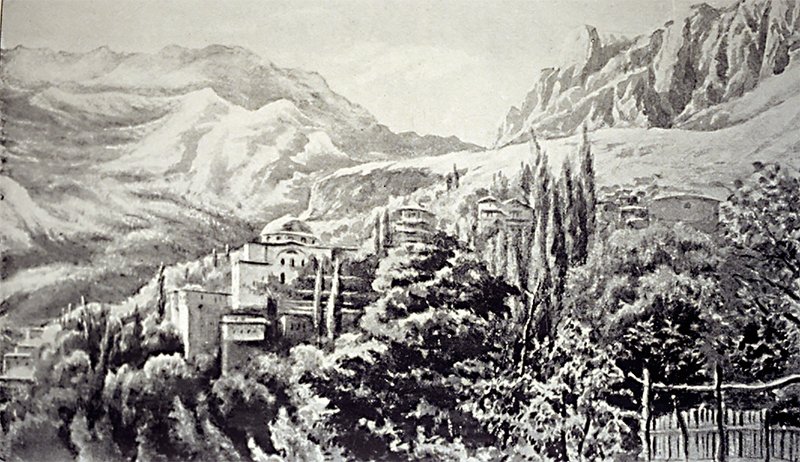 A. Shepigian, “Agna Gamaragabe” [“Gamaragab of Agn”], Pyuragn, 1899, August, N. 31-32, page 494. VOSB [? ], Surhantag, 1899, page 71. Agn yev Agntsik, page 76. Agn yev Agntsin, 1020-1915, page 29. Havadalik yev Oukhdadeghiner Agna Kyugheroum, Pyuragn, page 692. Agn yev Agntsik, page 78. Archbishop Kevork Arslanian, Pazmaveb, 1936, page 434; Agn yev Agntsik, page 79. “Agna Oukhdadeghiner” [“The Pilgrimage Sites of Agn”], Pyuragn, page 90. Agn yev Agntsin, 1020-1915, page 30. “Agna Oukhdadeghiner”, Pyuragn, page 92. Agn yev Agntsik, page 80. “Agna Oukhdadeghiner”, Pyuragn, page 91. Agn yev Agntsik, page 81. “Agna Oukhdadeghiner”, Pyuragn, pages 91-92. Ibid; Agn yev Agntsin, 1020-1915, page 30. Agn yev Agntsik, page 87. Toros Aghpar, A., page 249. Agn yev Agntsik, page 89. Agn yev Agntsik, page 90. Agn yev Agntsin, 1020-1915, page 36. Hnutyunk Agna, page 51, note 1. Hayots Lezvi Paraparayin Pararan [Dictionary of Armenian Dialects], Hrachia Adjarian Linguistic Institute, page 81. Archbishop Kevork Arslanian, Pazmaveb, 1936, page 435. Agn yev Agntsik, page 92. Agn yev Agntsik, page 93. Agn yev Agntsik, page 94. Agn yev Agntsin, 1020-1915, page 41. Agn yev Agntsik, page 98. Toros Aghpar, A., page 251. Agn yev Agntsin, 1020-1915, page 42. Agn yev Agntsik, page 99. Agn yev Agntsin, 1020-1915, page 44. Agn yev Agntsik, page 101. H.D., Arevelk [Orient], December 22, 1893. Vidjagakrutyun Agna Kaghakin…; H.D., Arevelk, December 22, 1893. Agn yev Agntsik, page 107. Vincent Yorke, “A Journey in the Valley of the Upper Euphrates”, The Geographical Journal, VIII (1896), London, page 334. Agn yev Agntsin, 1020-1915, page 39. Agn yev Agntsik, page 110. Archbishop Kevork Arslanian, Pazmaveb, 1934, page 301. Agn yev Agntsik, page 111. Archbishop Kevork Arslanian, “Badarigner Lousadzir Shapatatsyal Vankeren”, Pazmaveb, 1934, pages 300-301. Vark Srpots Harants yev Kaghakavarutyung notsin esd Grgin Tarkmanutyan Nakhnyats, Volume F, Venice, 1855, pages 251-255. “Badarigner Lousadzir Shapatatsyal Vankeren”, Pazmaveb, 1934, pages 300-303. Krikor Taranaghtsi, Jamanagakrutyun [Chronicle], Yerevan, 1951, page 162. Agn yev Agntsik, page 113. Hnutyunk Agna, page 58; Agn yev Agntsin, 1020-1915, page 50. Agn yev Agntsik, page 123. M. K. Vosganian, Arevelk [Orient], October 26, 1892. Agn yev Agntsik, page 124. Agn yev Agntsin, 1020-1915, page 51. J. Kuyudjian, Arevmoudk [Occident], September 29, 1946. Agn yev Agntsik, page 125. Yervroba, N. 4, page 163. Agn yev Agntsik, page 126. Yeremia Chelebi Keomurdjian, Orakrutyun [Diary], 1939, Jerusalem, pages 360-361. Agn yev Agntsin, 1020-1915, page 52. Agn yev Agntsik, page 127. Agn yev Agntsin, 1020-1915, pages 52-53; Agn yev Agntsik, page 128. The modern day photographs of Agn were put at Houshamadyan's disposal by the RAA foundation (Research on Armenian Architecture).